Celebrate with their birthday with our birthday girl banner t-shirt. Hand screen printed in a retro cursive font in the colour of your choosing, personalised with their year of birth in the little flag. 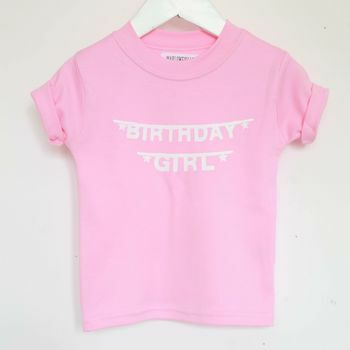 The great thing about this t-shirt is it is wearable all year round, not just on their birthday. This t-shirt is available in a range of colour t-shirts and inks. Please use the drop drown menu to browse. All our garments are hand screen printed using eco friendly water based inks. Meaning the print will never peel or crumple even if washed a million times. T-shirts are 100% cotton and super soft. We recommend washing them at 30 degress and hang drying to help maintain their shape the best. Avaiable in 0-3 months to 5-6 years. Please see our sizing chart by flicking through the photos.